1. Non-Slip Slicone Printing Grip cotton qulited Mini Oven Mitts, make hot dish/pan and other cookware handling safe and easy. Compact enough to take with you to dinner parties or any event on the go! 2. MADE OF HIGH-QUALITY MATERIALS, durable and designed with an updated look, great functionality, in amazing colors that fit into any kitchen. Outer Material 100% Cotton & Grip 100% Silicone Printing, Filling Content- 100% Cotton. 3. PROTECT YOUR HANDS IN THE KITCHEN For secure and comfortable handling of hot cookware, great for right and left-handed use. 4. SIZING AND DESIGN- 5.5" x 8" Mini Oven Mitts- 2pk, EASY STORAGE, complete with cotton circle loops on each Oven Mitt so you can hang them or store in any drawer. •Non-Slip Slicone Printing Grip cotton qulited Mini Oven Mitts, make hot dish/pan and other cookware handling safe and easy. Compact enough to take with you to dinner parties or any event on the go! •MADE OF HIGH-QUALITY MATERIALS, durable and designed with an updated look, great functionality, in amazing colors that fit into any kitchen. Outer Material 100% Cotton & Grip 100% Silicone Printing, Filling Content- 100% Cotton. 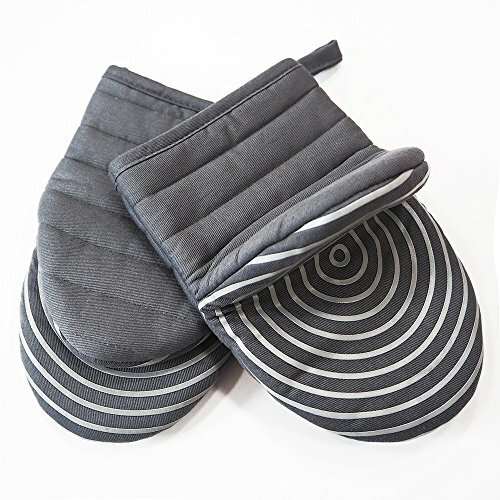 •SIZING AND DESIGN- 5.5" x 8" Mini Oven Mitts- 2pk, EASY STORAGE, complete with cotton circle loops on each Oven Mitt so you can hang them or store in any drawer. •MACHINE WASHABLE: This oven glove is machine washable and reusable, which directly decrease your using costs.